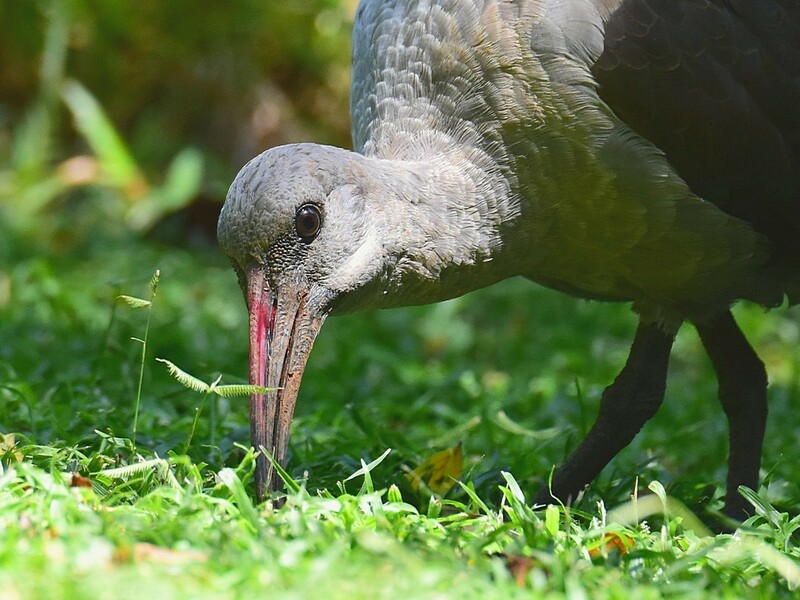 The Hadeda Ibis does not rank highly as most people’s favourite garden bird, probably because of their raucous, trumpeting call that can build to a deafening cacophony. 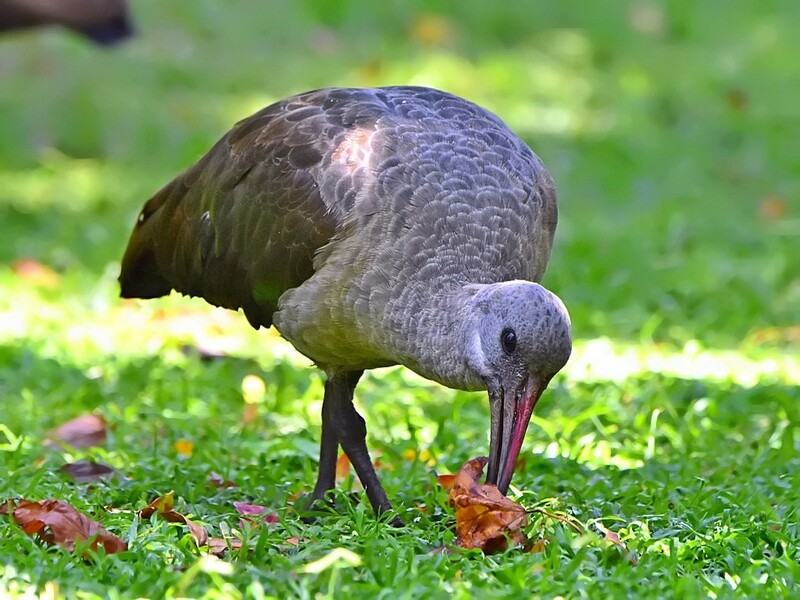 The Hadeda Ibis (Bostrychia hagedash) is a large (76cm) bird with a brownish-grey head, nape and neck. Despite their seemingly drab appearance, their rump and wing feathers have a beautiful metallic purple and green sheen. They use their long, black bill to probe into the soil in search of earthworms. A visit from a hadeda is a sign of a healthy garden, teeming with smaller wildlife species. Their probing search assists with the aerating of soil and the control of insect populations. Apart from earthworms, their diet consists of slugs and snails, spiders, crickets, insects on the ground and small reptiles (lizards and frogs). They have been known to occasionally eat dog food from bowls. They will visit a ground level water feature to drink and bathe. Despite their notorious racket, they are generally only vocal at dawn or when disturbed. It’s common to have 2 or 3 birds visiting the garden. As they are territorial, chances are you’ll have the same birds frequenting your garden. They are usually seen foraging in silence on the ground and if disturbed, will noisily fly to perch on roofs or tall trees. They build their nests in the fork of large trees usually 4-5 metres above the ground. Another annoyance to some people is their large droppings which can mess paving. It will easily wash off with the spray from a hosepipe and makes a good fertiliser. So next time you’re annoyed by a hadeda’s call, remember its important contribution to your gardening endeavours. Now it seems that mom, dad and baby have left the garden which mortifies me! The parents have been around (i think its the same pair) for years. Have i chased them away trying to be kind? Sorry to hear your distress. I hope this is just a temporary relocation and they’ll return to your garden. Continue to maintain what sounds like an ideal habitat and you’ll soon get the family back. My name is Anisa and I live in Kzn. I have been seeing a gorgeous Hadeda around for a few days, and I recently discovered that it seems to be unable to fly. The most likely scenario is an injured wing. Any ideas on what I could feed it? Also, do you have any ideas on how to catch it? I put out fresh water and soaked bread and I will wait for the vet to open tomorrow so that I can take it there. Alternatively, I may try and get them to come to my house and catch it themselves, since the poor thing is terrified and keeps hopping away when I get close to it. I am afraid it will injure itself further if I try again. Thanks a million. Thanks for visitign our site. I trust you’ve managed to find a solution for your hadeda without causing it too much stress. Dog pellets softened with a little water is a good short-term food to give to hadedas before you can get them proper care. Hi. We have a baby hadeda in our garden at the moment. Doesn’t seem t be able to fly too far which is a problem as my dogs are wanting to kill it. The mom seems to be keeping an eye on it, but I really need it get it out the garden before the dogs get it. Any suggestions? Apologies for the delay as we’ve just returned from a break. Hopefully your hadeda has been safe. The chicks can only fly short distances around the nest area for the first two weeks after leaving the nest. Thereafter, they are strong enough to fly longer distances. Unfortunately there is no way of speeding up this process, so we need to try to keep domestic pets away from them to allow them to develop naturally. Hi Sorry don’t have time to read previous comments. How long does a fledgling out of the nest take to learn to fly? Hes been in the garden three days today and I had to move the dogs to a paved yard but cant do that much longer. The dogs have killed one once before Going away on leave in a couple of days and dogs have to have their garden at that time. I’ve now suddenly been put in the care of an adult Hadeda with an injured wing. I’m going to try and take care of it until I can get hold of a proper bird sanctuary for it since the nearest one might just feed it to their predator birds. I’ve made it a small cage from an abandoned jungle gym in my yard, it’s not perfect but at least it isn’t in a basket anymore or at the mercy of the neighborhood cats. I need some advice since I am just a teenager busy with exams. It sounds like you’ve done your best for the hadeda. Try to get it to a bird sanctuary as soon as possible. This will reduce stress for both of you. All the best with your exams – seems like you’re going to ace biology! A hadedas fell from a tree on to my trailer .It has been there for 2 hours now .Another one paid him a visit earlier on ,but is now gone .He seems not to be happy because he’s now moaning .There’s a tree not about 10 meters away where they nesting .Do you think he’ll be fine ? The fallen hadeda could have been a juvenile that fell from the nest. Generally, if he cannot fly yet, the parents will come and feed him. If you have pets, try to keep them away from the bird until he is strong enough to reach a safe perch. As far as I’m aware, hadedas haven’t developed a taste for fizzy drinks. No doubt they left your garden due to the bad reception and the fact that fresh water isn’t on offfer! Hadida’s are beautiful birds, but we have to many in my garden, about seven at a time…..and they always eat my Labrador’s dry pellets!! And they mess around on my stoop and on our trampoline and around my swimmingpool, where they drank water from. So are there any ways to get rid of them? I once put a dog bowl upside ontop of the dog food but they shift it away and still eating the food. I don’t want them in my garden and to eat my dog’s food – help please ?? You’ve unknowingly created a group of habituated birds who know where to get food easily. The only way to get rid of them would be to stop leaving your dog’s food out and they will soon realise that your garden doesn’t supply tasty treats. I’m not saying you should stop feeding your dog! If you’re unable to change his feeding location to a protected area, you’ll need to remove the bowl immediately after he has finished eating. You could consider introducing a more active breed of dog that will chase the hadedas from your garden. Hi, i too have a hadidah family in the garden. Alida, my one bird landed tgis morning and the top portion of her beak is broken. It’s just hanging and swinging loose. She can’t eat the soaked dog pellets or peck for worms or grip fruit or pap – nothing! And she is trying, she must be hungry. What can i do?? She is going to die if she doesn’t eat! My heart breaks!! Oh, dear. This doesn’t sound good. If you can catch her, take her to your nearest animal rescue sanctuary. I have a lone hadeda who has been coming here for about 4 years. I read that hadedas hang around in small groups and mate for life. I fear his mate may have died. If this is the case will he find a new mate or remain alone? Also, strange question – is it possible to get homosexual hadedas and he may never find a mate. I find it sad that he’s always alone, he stays in my garden sometimes till after dark. Thanks for your input. Your observations are very interesting and could give some insight into these often misunderstood creatures. Yes, hadedas do mate for life. However, after the death of a mate, they usually find a new partner within a few months. Perhaps the resident bird in your garden is too old to attract a companion. They do tend to roost communally, so I’m sure he has opportunities to socialise with others at the roosting site. I live in Cape Town. there is a nest in the tree across the road from us and last night we noticed that one of the young ones had fallen into the road. we moved it onto the pavement shrubbery and kept an eye on it. it couldn’t fly back up and mom seemed more intent on keeping the other one fed. we brought it inside because of cats and traffic. I have earthworm farm, so I could try and feed it? but should i just pop them down its throat whole? Planning to take bird to World of Birds at lunch time. Will it survive till then? last time mom fed it was approximately 4.30pm Dont want to do damage by “force feeding it”. Thanks for your interesting page. Sometimes the adults will still take care of a chick that’s fallen from the nest before it can fly. Avoid force-feeding it, and rather get it to your nearest sanctuary as soon as possible. Hello! I rent a small unit in a retirement complex in Kwazulu-Natal. I have a nice little patio and patch of garden. Every morning I throw out pieces of bread and enjoy the birdlife that come to eat it. Sounds wonderful doesn’t it!? Well along with the small birds come at least 4 or 5 hadedahs. They never where a favourite of mine but I have really come to appreciate their intelligence and sense of humour! Also looking at them closely I can see what beautiful birds they really are. But and a big BUT across the way I have a neighbour who doesn’t like them. She has already reported me to my agent for “feeding the hadedas” and talking loudly on my cell phone! She believes that the hadedahs eat her plants. We have a variety of animals here from zebra, impala, blesbok, warthogs and other smaller animals. So if you don’t want the animals to eat your plants you can put up a fence around your garden. She doesn’t have one. So I have lowered my voice whilst speaking on my phone but still continue to throw out bread in my garden that has a fence! The feud goes on! By the way I am on very good terms with all my other neighbours and they say they have no problem with the hadedahs! Really at our age I feel we should have come to terms with the phrase “live and let live”! I’m glad that you’ve come to appreciate the Hadedas through your observations. Hadedas tend to uproot young seedlings in their search for earthworms, so perhaps that’s what your neighbour is referring to when they “eat her plants”. Enjoy all your wildlife experiences and please continue sharing any other observations. Hi I have a Hadeda visiting reguarly, but both its legs are tied with fishing line. it lies down whilst feeding. it can fly so i can never get too close to be able to catch it and remove the line. Any ideas how i might be able to catch it so i can help remove the line off its legs. The best way is to encourage the bird to eat as close to an enclosed area as possible, and then set up either to use a large net or to be close enough to throw a large towel or blanket over the bird. I’m not sure where you’re located, but, Friends of Free Wildlife has representatives in the northern suburbs of Johannesburg and has nets that you could borrow for this purpose. They’ll even be able to take care of the bird if it is injured. 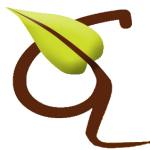 Visit http://www.friendsoffreewildlife.co.za to get in touch with them. The hissing sound is made by a juvenile when begging an adult for food. The juveniles are reliant on the adults for food up to 60 days. However, some are more stubborn and can remain with the adults for as long as 110 days – by this stage they are the same size as the adults. 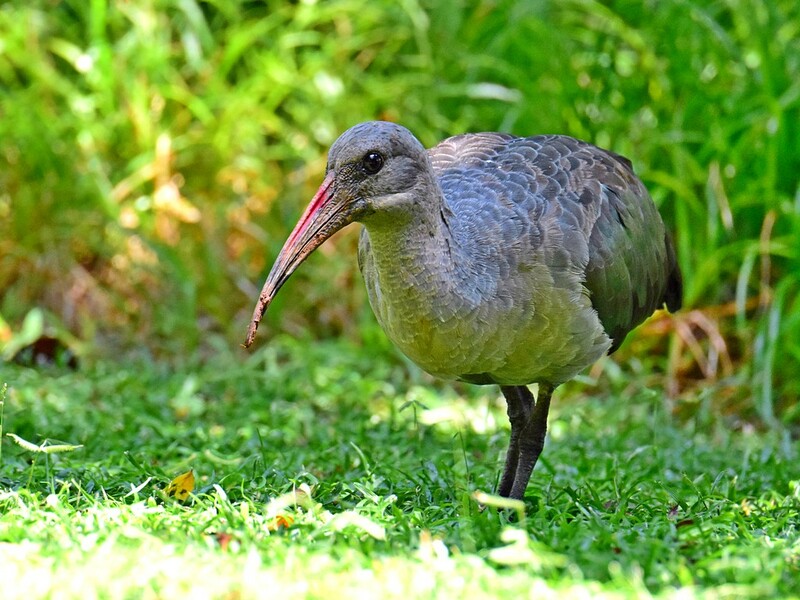 We have a few Hadeda that visit us daily and they have brought 2 chicks to us over the years. One parent had a lower beak that is not aligned and struggled to eat. We find that wet dog food is his favourite and they all approach us every morning to remind us they want breakfast. They are very tame and feed out of our hands. We have 22 species of bird visiting our small townhouse garden for food every day. Mielies, bone meal balls, seed, apple, banana and paw paw are a daily feed table requirement. Thanks for visiting our site and for your valuable comments. we have about 12-14 hadedas in our garden, nesting in our trees. they are magnificent but the only issue is they make larges white gooey messes that are difficult to clean up especially when baked in the sun. this on our new deck and furniture requires daily maintenance. we can’t be outside all day to shoe them away. What do you all recommend? Sometimes people use large plastic owls in the garden to scare away some animal. any ideas would be welcome! Thank you,.. Sorry about the mess. You can try the owls. Also, if you can get up the tree, try hanging some old CDs from the branches. The reflections may make the perches less favourable. We recently moved into a house with a beautifully landscaped garden… with many Hadedas. Though I don’t mind them in the garden I would like to find a way to keep them off the patio. They walk right up to the sliding door and knock on the door (they have even wandered into the house) as well as leaving droppings right in front of the door. We have a large covered patio and they leave their droppings on the furniture. Is there any way to keep them from venturing into the patio area? Hadedas become rather brave and can become a nuisance like yours. The only way to prevent this is to shoo them away from areas where they’re not wanted. This could mean chasing them away from your garden for a while. Please excuse my simpleton question. Do hadedas have a sense of smell? I mean how do they know exactly where to probe for earthworms? Do their beaks have other sensory abilities? I am a keen organic gardener. I have installed several earthworm towers in my garden. The perky birds have discovered this and dig up my seedlings around the towers in order to feast. I have tried strings of broken mirror pieces to scare them off. To no avail. They are welcome to the earthworms (I do vermicomposting) But the poor defenceless seedlings…I do not have dogs & my cats are scared of them. Any advice? Birds certainly have senses which that help them source food. I’m not an ornithologist, but always marvel at how quickly birds and other creatures arrive to a new food source. Well done on providing for them with your earthworm towers. I’m sure they are not deliberately trying to sabotage your gardening efforts, so don’t get mad at them. Instead, consider planting your seedlings in pots until they are big enough not to be dug up by the hadedas. Alternatively try planting something a little more hardy near the worm towers. I have an injured adult hadeda in my garden….one of a pair that has been residing here for a few yrs…I cant see a visable wound on its leg…but he seems in pain and limping badly….I really need to catch it and get it to CROW for some medical attention….how do I catch it….he is a bit less tame right now …they normally just abt eat out the foid bowl before I even put it down….I dont want to traumatise it too much with capture…..any suggestions?… Someone suggested throwing a blanket over it..if I can get close enough….???…. I stay in dbn north…..
You could try throwing a blanket or large towel to catch the bird. A Hadeda – with a seriously injured foot – has been hanging around our garden for the past week or two. It can fly, but he/she spends most of its time on the ground, flamingo style. I haven’t yet heard the Hadeda’s call and it’s entirely alone. With the current drought we don’t have much of a garden. Is there something I can put out to feed it and if so what? Should I put out a bowl of water? It would be great to leave a bowl of water close by for the wounded bird. As for food, they tend to eat earthworms, snails and other insects. Perhaps try some dog food pellets as they are known for sometimes raiding dog bowls. The hadedas ( their nest is in a neighbouring yard ) that daily visit our garden , have two chickens . They first brought the smaller of the two in the 24th of December and walked with it around the garden . We noticed that it could only flutter and fly approximately one meter and not ascend yet .That evening they we calling it but had to leave it and fly up in the trees , the one parent stayed with it until nearly completely dark . We noticed the parents were back the following morning and then with a second , larger chicken that are also still being fed but can fly . At nighttime the parents now try to roost in our trees that are not quite adequate as they are smaller than the nesting tree but they make do , and the larger chicken can also manage to get up there . The little one tries every night to flutter up the trees but could not succeed yet . It tries to fly and sometimes stand on anything elevated like a moles heap and then try to fly . Eventually it gets too dark and the last glimpse we have of it is that it is sheltering under the trees in the vegetation which is quite thick .The other three watch from the trees and early in the morning they are again grazing around the garden . Both chickens peck but are still being fed . Could you tell how long it will be before the chicken will be able to fly ? We feel quite helpless . All we could do is to keep our dogs from the back garden .We also worry about water .We wanted to place a small tub with water but are also worried about drowning . Does the chicken get water when being fed by the parents ? We will appreciate any advice you can give us . We live south of Durban on the Bluff . Thanks for your observations of this magnificent bird. Apologies for the delay in responding as we were closed for our festive break. Have you any further news on your chick? We have a hadeda with an injured wing. It is probably broken. We are reluctant to try and catch it. Do you know if it will peck? It has quite a sharp beak. Apologies for missing your mail as we were closed for the festive season. I trust you’ve sorted the hadeda issue. We have Hadedas in our garden for years. They nest in the big trees and have been doing so for the past 10 or more years. We feed the other birds with wild bird mix and similar. Is there something that I can put out to feed them? Hadedas tend to look after themselves, although you can indirectly cater for them by having a healthy green lawn in which they’ll find loads of earthworms. Also, bedding plants like Agapanthus and Hen-and-chickens seem to attract snails which the Hadedas feed on. Most importantly, try to avoid chemical fertilisers and pesticides which could affect the birds and other creatures. Thanks for visiting our page and for sharing your love of the hadedas. I have Hadedas visiting my garden daily and yes, their call isn’t the most beautiful and yes, their droppings are messy, but I welcome all birds in my garden. My cat watches them quietly without wanting to chase them like it does with other birds. It’s great to see all the holes in the lawn where they’ve been looking for food & I know they keep the cricket population at bay! Thank you for sharing my view and for visiting our website. No doubt you’ve a healthy and well-balanced garden with your natural insect controls. Hadedas are delightful, so I’m glad you agree with me. I wish someone would ‘reprogram’ their horrible intrusive sound to something more melodious..! Beauty is in the ear of the beholder! Imagine how impressive they sound to their companions.